Mouna Sepehri holds master’s degrees in international law and Private law, a postgraduate degree (DEA) in Business law and Stock Exchange law and is qualified as a French Barrister (CAPA). She started her career in 1990 as an attorney in Paris and, later, in New York, specializing in Mergers and Acquisitions, and International Corporate law. She joined Renault in 1996 as Deputy General Counsel for the Group. She took part in the original negotiating team that created the concept and scope of the Renault-Nissan Alliance. In 1999, she actively contributed to the acquisition of the Romanian car company Dacia. One year later, she did the same for Renault’s acquisition of the South Korean carmaker Samsung Motors. In 2009, she became Director of the Alliance CEO Office and Secretary of the Alliance Board, which entailed overseeing the implementation of news synergies between Renault and Nissan. In 2010, she managed the negotiations between the Alliance and Daimler and became a member of the Steering Committee that launched the landmark collaboration between the three manufacturers. 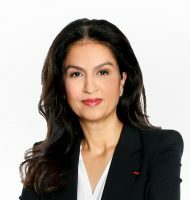 On 1 April 2019, Mouna Sepehri becomes Special Advisor to the CEO, Groupe Renault. Mouna Sepehri is a member of Groupe Renault Management Committee.